For this blog article I want you to mentally picture yourself standing in the middle of your production floor. It’s busy, with orders being produced and a lot of activity. With a discerning eye, watch how your orders are moving through the shop. Each job has to go through each department for them to complete their tasks, with the end result being the order ships and gets invoiced. Depending on the size of your shop, you could have a dozen or more people touch the order…or maybe it’s just you, as you are the only employee. Customers. You have to simply the process for them. How they receive information from you. How they place an order. How they experience your shop. Think about standing in their shoes trying to do something with your company. What is the experience like for them? Are you a disorganized mess or smoothly professional at every turn? Simplify the ordering experience by having branded forms, a website, or an information packet ready. This should be professionally designed, and outline all the information they need. Depending on the market you serve, have the most popular questions that you are asked answered first in the verbiage of your piece. Be consistent. People like stability, and nothing is better for business than doing what you say you are going to do. From a “simplify the experience towards a customer” standpoint, this means you need to work towards completing the order accurately, on-time, with zero mistakes. If there is a challenge along the way, be sure to contact the customer early and let them know what’s going on, and have some options prepared. This is harder to do, as it takes a good bit of internal communication and company discipline. For more information on shop scheduling, click here. Your Webpage. Is it the right tool for the job for your market? Is it just a stagnant branding stop, or does it continually send you orders? How are you competing against shops across town or across the country? Is it easy to navigate and place an order? Does it look like your fourteen year old cousin designed it? I’ve clicked on dozens of t-shirt shop websites in the past year or so, and the only thought in my brain was “how are these guys still in business?” Think what a potential customer might think if they found your site. Receiving. You have to decorate something, and this is where it enters the building. They absolutely have to be 100% perfect in their jobs. Things can get tricky sometimes though, so think about your company and your processes. Are they working smoothly enough? Every job has to be counted, marked against the order and properly labeled with the order number, due date, job name, client name, size split, and number of boxes for the order. It is crucial that there is an accurate count on the day of delivery. You can’t do it tomorrow. Any discrepancies need to be reported to the customer service representative for action. If you purchased the goods, you need to call your distributor. If your customer sent in the inventory, notify them and get the ball rolling. If you label all boxes with an order number, it’s easy to segregate the inventory on the floor and arrange it so others can locate jobs quickly. Use the last digit of the order number and create numerical rows on the floor or shelf. Everything ending in “0” is in one row; everything ending in “1” is in another, and so on. Make sure that your labels have box 1 of 4, 2 of 4, 3 of 4, & 4 of 4 on them, for example, so anyone pulling the job can be assured that they are grabbing the entire inventory. Not all boxes may be the same size, color or shape, so use the label as the identifying piece, and put the label on in the same location every time. Set up your “purgatory area” for jobs that are partially received away from your staged goods area so there isn’t any mix up. Arrange using the same last digit method for easy locating later. When more goods arrive to complete the order, be sure to recount the total order to double check the count is accurate. Art & Digitizing. Shops have to decorate something, and it all starts with this group. If you ask any artist about what would make their life easier, having art instructions that go beyond the phrase “Do something cool” is a good place to start. Standardize constant dimensions such as full front, left chest, etc. for size, placement and when to use these for jobs. This makes creating the art file much faster as it takes the guesswork and personal preference of the artist out of the picture. Draft a branded guideline that you can send to your clients and their art departments, so artwork and expectations come “pre-loaded” the way your shop handles things. For ease of use, have your art department try to use the same core set of colors on jobs where the client hasn’t specified what Pantone color or thread color to use for the order. For example, PMS 286 could be the go-to royal blue in your shop. This makes setting up jobs faster in production, reduces the amount of ink or thread on the floor and just simply makes life easier. Have a pre-designed company branded artwork guide that also has a list of acceptable file formats, common print location dimensions, why fonts should be converted to outlines, the entire “Raster vs Vector” story, and other useful tips on how to send files to your company. Send this out to new customers, local design agencies, and have it downloadable from your website. Make sure your sales reps and customer service folks have copies and can distribute them early on in the process with new clients. Always send out an approval form for any work that is being printed or sewn. This form should show the colors (ink or thread), dimensions, file name, order number, customer’s PO number, artist’s initials, and have both an enlargement of the file and show it on the garment in the correct proportions. Include some dimensional references such as “3” down from collar”, or “even with top of shirt pocket” to give your production staff and the customer some guidelines as to how the image will be produced. Make sure this prints in color and travels with your production documents so that your crew can use it to set up the job. Production Staging. Simplifying how to layout your shop floor can go a long way to increasing your efficiency and daily throughput. Your production floor is the most prime real estate in your shop. Anything that isn’t necessary to today’s production shouldn’t be anywhere close to your equipment. Store that stuff somewhere else. Shelves or racking is a great place for non-essential items. Think about how often you touch something. Daily? Hourly? These are the items that get the prime real estate. Everything else should be put away. You need to build the workflow to make the production operator’s job easier. Everything flows to them, and is set up and ready to rock and roll, the moment that the previous job comes down. 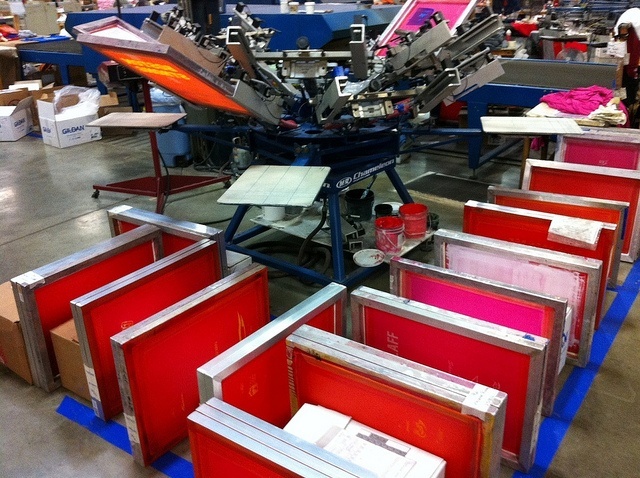 Shirts, ink, & screens are all “kit packed” and lined up in rows near the machine. You should never, ever, see an operator looking for a bucket of ink or a screen. Build the support so all they have to do is run. Problems on press? Job needs approval? We place cheap fire engine type lights on large poles that have a switch that the operators can turn on when they have a need for a floor manager to come over. This is an immediate signal, and is reacted to very quickly. Do you print the same image repeatedly every week? Build a screen cabinet or have shelving to keep the screens by the press that you usually run the job. Also, have a different rack for saving screens after a sample is printed, there was a question on the order, or for any reason that the screens shouldn’t be reclaimed right away. Keep this near production. Supplies. Are your staff members constantly fighting over the calculator, box taper, hand-truck, tape measure or other item on the shop floor? Get off your wallet and buy enough for everyone to use. You have to make it easy for your crews to do their job. Figure out what the basic items are and then make sure everyone has them. Shipping. This area can get congested and confusing quickly if you aren’t proactive on how you build your procedures. Have designated areas or skids for items to be shipped. UPS, FedEx are obvious…but what about “Orders to be Shipped Together” or “Orders Without Shipping Instructions”? The trick to moving fast in shipping is to segregate the work by ship method or challenge. Barcodes. Some shop software platforms are using barcodes to bring up orders and pre-enter information. These print on work order documents and when scan quickly launch into the correct order. This makes shipping a breeze, as your staff member isn’t typing in the information. Shrink-wrap. We moved last year to a thicker, stretchier shrink-wrap. This allows pallets of boxes to be wrapped with less material and trips around the pallet than the cheaper, thinner kind we were using before. There is a different technique involved, as you have to pull back while you are wrapping to snug up the material tighter…but at the end of the day you use less shrink-wrap, make fewer trips around the pallet, and have a very snugly wrapped parcel to ship. Sustainability. You knew I was going to throw this one in somewhere! If your crew thinks about how or what they can simplify in your shop, you are taking steps towards building a sustainability program. How about that!! The great thing about a sustainability program is that if you do it right, it will save you money in the long run. This makes you a stronger, more profitable business. Think about material usage. What item in your shop could you find to reduce or eliminate in your process? For us, one of the items was masking tape. This was one of the very first sustainability projects that we finished, and we no longer use masking tape for taping off the inside of our screens for printing. (Still use it for registration marks) This has saved us $7,000 a year in tape, plus all the labor putting the tape on, and taking the tape off. Energy. Think about how you use energy in your shop. How can you simplify the way you use energy? Motion detectors in the breakrooms or bathrooms? Turning off items when they aren’t in use (like flash units on press). Walk around your shop and take note on all the things that are powered on, but aren’t in use. Ask why? You are paying for that. Recycling. For some shops it’s harder to build a recycling program, as there isn’t a way to get the material picked-up as it’s not offered. (It should be! Call someone…) To build your program internally it takes a lot of work and training to get everyone used to making good choices, and segregate the material for you. Make it easy for them by placing smaller containers by their work, and have those emptied into larger bins that are away from the floor. We’ve just ended our one year anniversary with our recycling program, and we’ve saved 38+ tons of cardboard, plastic, paper and metal from going to the landfill since then. At the end of the day, your shop will operate exactly how you let it happen. It’s up to you as a leader to build and control the culture. You have to talk to your staff constantly and find out where there the pain is with their work and help to find a good solution. If you make it easier for everyone to do a good job; that action will naturally follow. Simplifying processes and outcomes is hard work, as the decisions you need to make are not always obvious. There is a lot of trial and error. Ask people’s opinions. Get input. Try something and if it doesn’t work try something else. You can do it! I would love to know what you used in place of masking tape on the screens. Please share! Spot on Marshal, going to start implementing some of these right away. I think quarterly or at least twice a year, every shop should take a step back and re-evaluate a lot of these things to see where they can make improvements. A bunch of little changes can make a huge impact on the overall bottom line of any shop big or small. Great site, continuee the good work!